AppGini allows you to create member accounts and control the privileges of members. For each table in your application, you can control whether members can add new records, edit existing ones, and/or delete records. Moreover, you can control which records a member can edit and/or delete: only his own records (records added by the member himself), or his group's records (records added by any member of the group to which our member belongs), or all records entered by him and any other member of any group. 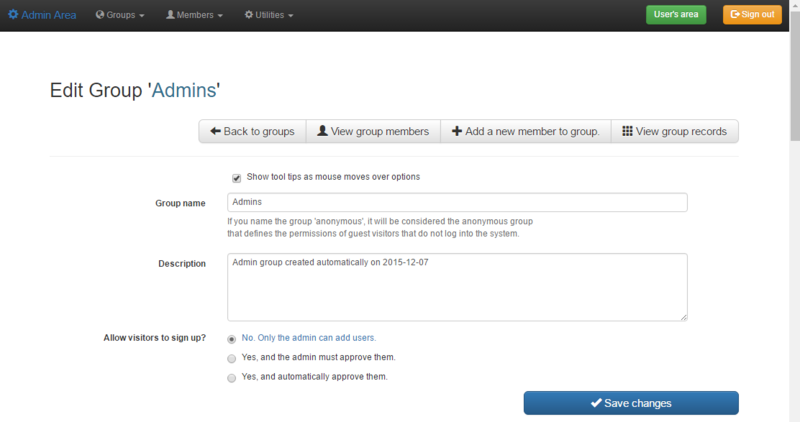 To make administration of members easier, AppGini allows you to create groups and assign each member to a group. Thus, instead of assigning privileges to each individual member separately, you assign privileges to a group. All members of the group are then automatically assigned these privileges. For example, if you are developing a content publishing application, you might create an authors group that has the privilege to add new records to the articles table. Each member of the authors group can edit his own records (articles), but not the articles of other members (authors). You would also create an editors group. Members of this group can edit any record in the articles table, but are not allowed to delete or add records. Finally, you might create a subscribers group. Members of this group can only read articles (that is, view records of the articles table), but not edit, delete or add records. The admin interface allows you to define groups and their privileges, approve and ban members, send email notifications to groups or individual members, plus other administrative tasks. Of course, you should change the items in italic in the above URL to your actual server name and application path. The above URL should display the following screen. The default username is admin, and the default password is admin. When you sign in for the first time, you should change them from the Admin Settings page. After signing in, you'll see the admin homepage, which provides a quick review of latest events: newest members, most active members, newest records and updates, plus links to all admin tools. To view available groups, click the 'View Groups' link on the top of the admin homepage. This would display a page similar to this one below. If you click the "Edit" icon to the left of a group, you can edit the group's details and permissions (privileges). This will open a page similar to this one below. 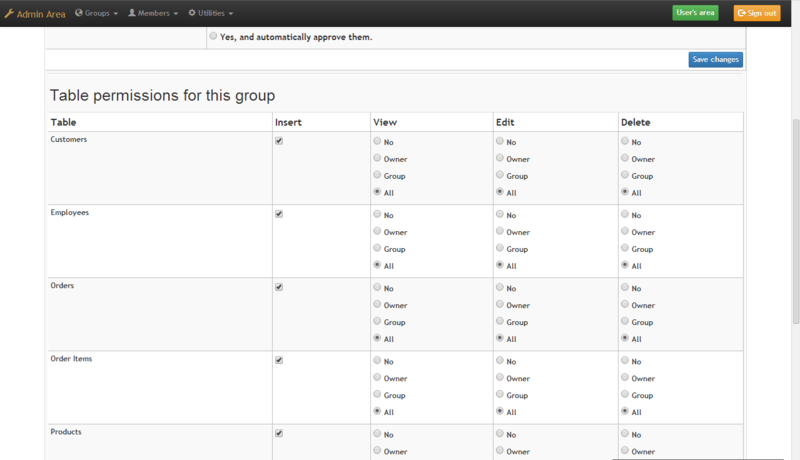 Scrolling down the group editing page, you'll see the group's permissions for each table. If you pass your mouse pointer over any item in the permissions section, you'll see a detailed description of what it means. To define a new group, click the 'Add Group' button on top of the admin homepage. This will open a page similar to the group editing page but with empty fields for you to fill. To view available members, click the 'View Members' link on the top of the admin homepage. This would display a page similar to this one below. If you click the "Edit" icon to the left of a member, you can edit the member's details. This will open a page similar to this one below. Note that AppGini allows you as an admin to ban (suspend) members temporarily. A banned member will not be able to sign in. You can unban him at any time later. 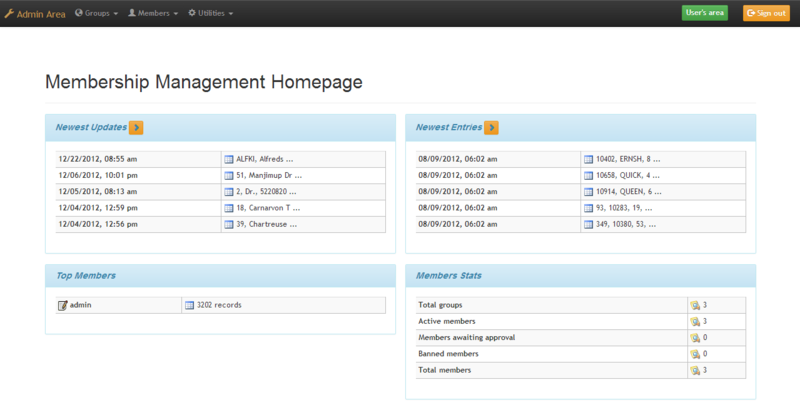 The admin interface allows you to view all records entered by any member or group. Click the 'View Members' Records' link on the top of the admin homepage. This will display a page similar to the one below. If you click the 'Edit' icon to the left of any record, you can view all the data in that record, and you can also edit the record ownership. This will open a page similar to the one below. If you want to change the ownership of multiple records at once, you should use the 'Batch Transfer Wizard' instead of the above page. Click on the 'Batch Transfer Wizard' link in the admin homepage and follow the wizard instructions. The 'Batch Transfer Wizard' allows you also to move members of a group to another group if you want to. In addition to the above, you can use the admin interface to send email notifications to all groups by clicking the 'Send a message to all groups' link in the admin homepage. Changing the admin username and password. Changing the name and email used for the sender details when sending email notifications to groups or members. Define/customize up to 4 info fields that new members are asked to fill during sign-up. 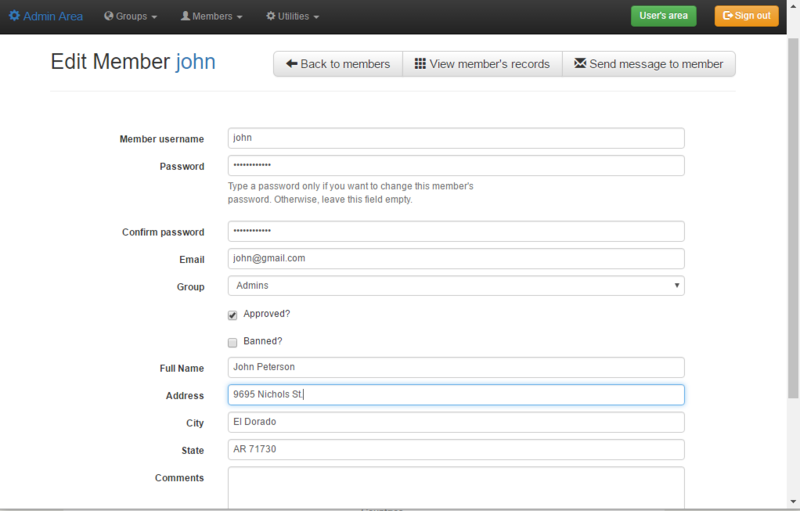 Customize the contents of the email sent to new members when they are approved. Customize the date format used to display dates in the admin interface. 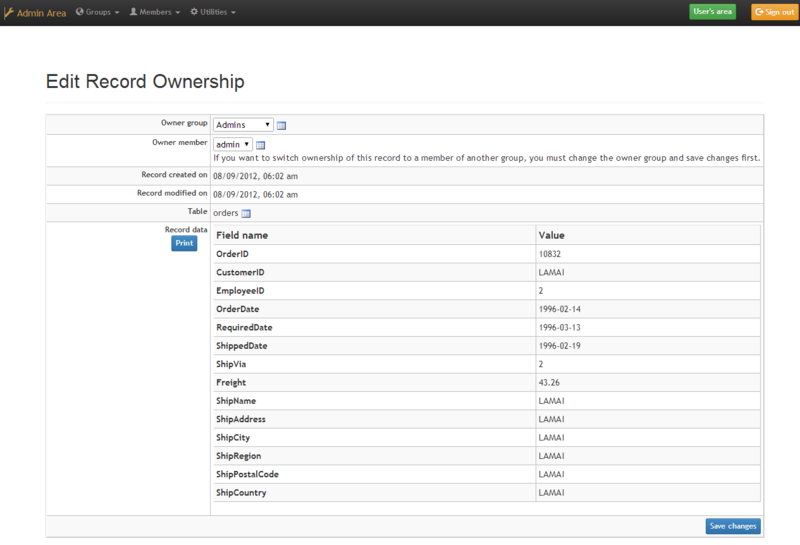 Customize the number of rows to display per page in the 'View Groups', 'View Members' and 'View Member's Records' pages. Define the default sign-up mode for new groups. Change the name of the anonymous group and anonymous member.